EVERY LITTLE HELPS - Another carrier bag sir? This man probably does not know that his purchase is likely to play a part in killing marine life - and that the toxins plastic carries when in seawater may find its way into his stomach one day. 1.3 billion plastic carriers may not be seen as a "little" bit of waste and nothing to worry about. It is still a large plastic mound that combines with all the other mounds around the world to poison our oceans. Contributing to ocean waste research would help us significantly and if a vessel like SeaVax hits the oceans as a result, then every donation would count no matter how small. According to a UK Government website, since 5 October 2015, large retailers in England have been required by law to charge 5p for all single-use plastic carrier bags. These retailers are required by law to report certain information to DEFRA, and they provide other information on donations on a voluntary basis. This publication summarises data collected by DEFRA for the full 12 months reporting year from 7 April 2016 to 6 April 2017. We previously published a summary of the data for the half year from 5 October 2015 to 6 April 2016. They have published the full dataset on data.gov.uk. This includes the details provided by each retailer. Large retailers in England sold 2.1 billion single-use plastic carrier bags during the year from 7 April 2016 to 6 April 2017. They sold 1.1 billion single-use carrier bags during the first 6 months in 2015 to 2016. Out of the total, the 7 main retailers (Asda, Marks and Spencer’s, Sainsbury, Tesco, The Co-operative Group, Waitrose and Morrisons) sold around 1.3 billion single-use plastic carrier bags. In the initial 6-month period in 2015 to 2016, they sold 0.6 billion single-use plastic carrier bags. Their data indicates that the 7 main retailers issued around 83% fewer bags (over 6 billion bags fewer) in 2016 to 2017 compared to the calendar year 2014 (for which WRAP reported data). This would be equivalent to each person in the population using around 25 bags during 2016 to 2017, compared to around 140 bags a year before the charge. Almost two-thirds of retailers voluntarily provided additional information on how much they had donated to good causes, and provided details on the type of good causes chosen. Of the retailers that provided data in 2015 to 2016, 13 (5%) have now changed to using either paper bags or re-useable bags and are no longer required to report on the number of bags used. They had previously reported sales that accounted for 0.2% of the total number single-use plastic carrier bags in the 6-month reporting period for 2015 to 2016. Almost two-thirds of retailers voluntarily provided additional information on how much they had donated to good causes. These retailers donated over £66 million pounds to good causes amounting to 4 pence for every single-use bag sold by them. The chart below shows the types of good causes to which retailers donated in 2016 to 2017. This chart only covers those retailers who reported on this. In total, 168 retailers provided this information, including all of the seven main retailers. 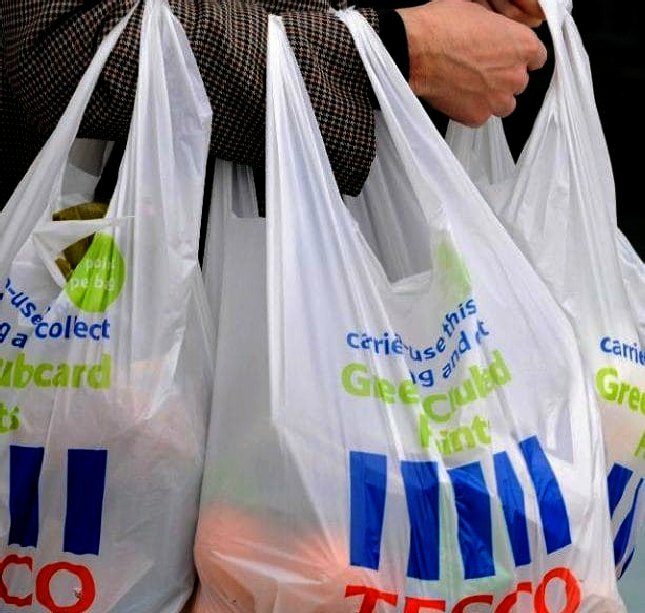 WRAP previously reported information on carrier bag use based on a voluntary agreement with 7 major retailers (Asda, The Co-operative Group, Marks & Spencer, Morrisons, Sainsbury’s, Tesco and Waitrose). Their data for 2014 showed that these retailers issued 7.6 billion single-use plastic carrier bags in England during that calendar year. 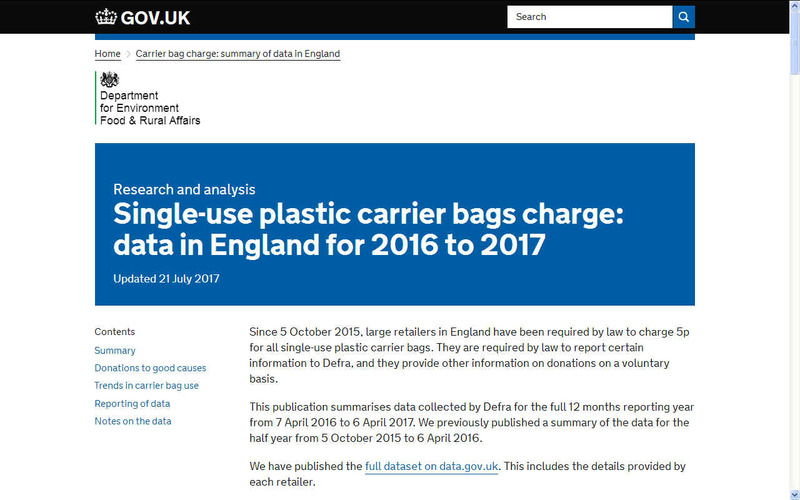 Defra’s data for the year from 7 April 2016 to 6 April 2017 shows a very substantial fall of 83% in the number of single-use plastic carrier bags issued by the seven largest retailers to just 1.3 billion single-use plastic carrier bags. The data for the full year 2016 to 2017 are not directly comparable against the data from the previous six months for 2015 to 2016, because some retailers have seasonal differences in sales. The headline figures on donations are therefore not directly comparable. They have published a methodological summary alongside the full dataset on data.gov.uk. IF WE ALL PULL TOGETHER - Scenes like this could be a thing of the past. A society based on plastic has to come to terms with what they are doing collectively and act to restore the planet to its former glory.